Safety and environmentally friendly materials: no BPA, no Pb and no Phthalates, safety testing has been approved. This toy set is made of environmentally friendly and child-safe plastic and does not need to worry about the safety of the child. More importantly, environmentally friendly materials can keep your baby away from allergies. CALM fear 35 PIECES DENTIST KIT: Medical kits can help your child reduce the fear of seeing a doctor, understand and be familiar with the doctor's medical procedures, such as listening to the lungs when coughing, opening their mouth to check their tonsils, or pretending to play The dentist cleans his teeth and the Montessori Children's Medical Kit teaches the child to familiarize himself with all the gadgets and equipment used by the doctor. STIMULATE KID'S IMAGINATION: The medical set can help your child understand the doctor's medical procedures, explore empathy and care for others, bring them a new experience of being Nurse & Doctor.A perfect gift for 3 years old up children's birthday,suitable for parties, pretend games, role playing, school classes, holiday toy gifts, also for Christmas, Thanksgiving and other festivals. PORTABLE CARRYING CASE INCLUDED: This medical doctor kit,all 35pcs can be packed in a durable and portable gift case.The size of this case is about 7.8" L X 5.9" W X 5.9" H Children over the age of 3 can also easily go to the emergency room to play anywhere. 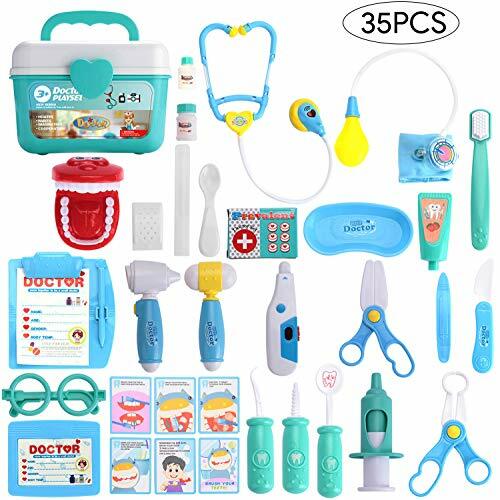 100% MONEY BACK GUARANTEE: This must be the best doctor kit you've ever found.We believe you will love this medical doctor toy.If you are not satisfied with this pretend doctor set,we can offer 60 days return with a full refund, or 365 days Replacement Warranty. Order Now!